How SIPS can save you energy, time and money. Structural insulated panels (SIPs, also called stress-skin panels) are sensible, affordable and earth friendly. What’s more, a SIP wall system may have the single most positive impact on your home’s construction, budget and long-term efficiency. Many energy-minded and prefabrication companies use SIPs to enclose their homes since they’re a great way to minimize thermal bridging and enclose the home quickly. They’re also smart when you consider that heating and cooling costs are on the rise. Using SIPs to cover a home can save you as much as 60 percent on your annual energy costs. A key component of the comprehensive new building code requirements for residential construction is more stringent requirements for energy efficiency in walls and ceilings, and enclosing the your home with SIPs is an easy way to meet those requirements. Plus, SIPS combine a firm wall, exterior sheathing and hearty insulation into one step: fastening a panel to the outside of the home, making the installation fairly quick and easy. Although individual products from manufacturers vary, today’s SIPs all have a solid core of insulation sandwiched between two layers of oriented strand board (OSB). 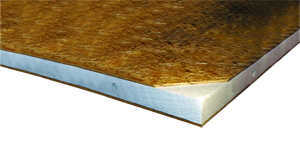 Other materials used in SIPs include plywood, wafer board, sheet metal and gypsum board. The white core often is polystyrene, extruded polystyrene, Styrofoam or polyurethane — the same durable yet lightweight foams used in bicycle and motorcycle helmets and egg cartons. SIPs are available in a variety of thicknesses and sizes ranging from 2 to 12 inches thick and in sizes from the standard 4-by-8 to 8-by-24 feet. Panels generally weigh less than 4 pounds per square foot, making them light enough to install by hand. A crane often is used for larger roof panels or for lifting bundles of panels on the job site. SIPs cost 2 to 5 percent more than materials used in conventional framing, but if the home is designed with SIP application in mind, you actually can save money and minimize onsite waste by making the most efficient use of each panel. Once the SIPs are installed, you can apply virtually any finish—stucco, stone, brick or clapboard—to polish off the exterior. Discuss the options with different companies to get a clear picture of the advantages and drawbacks of each material specific to your design and geographic location. SIPs are growing in popularity for all types of homes, but especially structures that are aiming for maximum efficiency and sustainability. Here’s why. They go up quickly and easily. Depending upon the size and design of a home, it can be enclosed with SIPs within days or even hours. This saves money on labor, insurance and financing, as well as energy on the job site. They’re energy efficient. This material cuts heating and cooling costs by as much as 60 percent over products used for conventional “stick” construction. Even where wall thickness is the same, SIPs outperform stick framing on whole-wall energy performance by 40 to 60 percent, according to a study by Oak Ridge National Laboratory. They’re soundproof. SIPs block sound like few other materials—a big perk, especially in bedrooms, dens, home offices and media rooms. They’re environmentally friendly. Components that comprise SIPs come from renewable resources. The insulation is a form of plastic, and oriented strand board (OSB) is made from fast-growing trees and shrubs once considered waste by the lumber industry. For more information, check out sips.org.